According to Jetpack, I officially started working on this site back in December 2012. To be clear, this is not my first blog nor is it my first attempt at this particular domain, but December 2012 marks when I first began to get really serious about blogging. And by “serious about blogging” I mean having a distinct set of goals that I wanted to achieve, topics that I wanted to cover, and how I wanted to go about growing the blog over time. Granted, we all have different metrics of success. Some of us want hits, some of us want low bounce rates (or high time on site), some of us want comments, and some of us want all or some of what’s been mentioned. To be honest, the main things I set out to do with this blog was to provide a resource on what it’s like to work as a professional WordPress developer (which is a discussion in its own right) and to share my experiences along the way. I have no plans of stopping, but I’d like to think I’ve done a fair job of that over the past couple of years (with the last year being the most notable). But, just as we do with software projects, the time eventually comes in which you have to remove features, improve features, add new features, and so on in order to continue making whatever it is that you’re doing – be it a service, a product, or even a blog – better. 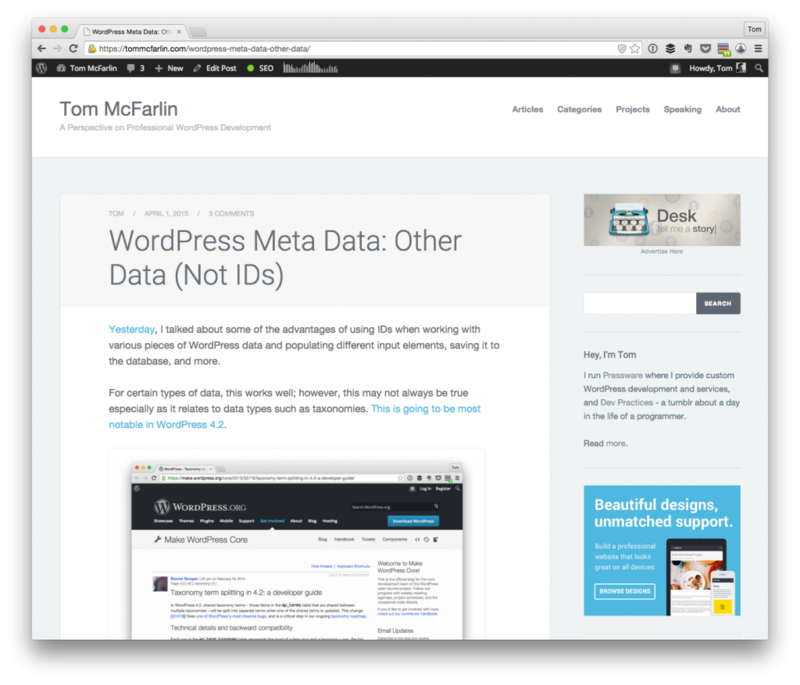 @tommcfarlin I’m digging the new blog look, man. Matt was one to notice that I’d changed from my own Mayer theme to a new theme. Specifically, I’ve gone with Author by Array. There are a number of reasons of which I’ll share in more detail in a later post. But this did lead me to thinking more about sharing what I’ve been working on as it relates to this site and to Pressware over the past month. With the exception of a single contract, I took the month of March off to really, really focus on Pressware and what I wanted it to look like as a business. Originally, I thought I wanted to grow a product vertical out of the business that has historically been a service-oriented business. It’s not that I think one variation is better than the other, but it’s that I originally thought that it was the next logical step for me to take as it relates to what I was doing as far as my employment – my livelihood – went. As it turns out, that wasn’t necessarily the case. Sure, I’m still working on things: Mayer is still on GitHub and it for sale on WordPress.com and I don’t currently have plans to change that. I plan on open sourcing the Image Widget that I was previously selling, and I plan to continue working on plugins (I do prefer building those as opposed to themes). But I also realize that I enjoy building relationships with other individuals and companies and building tailored solutions for them. I really want to focus on continuing to do that. 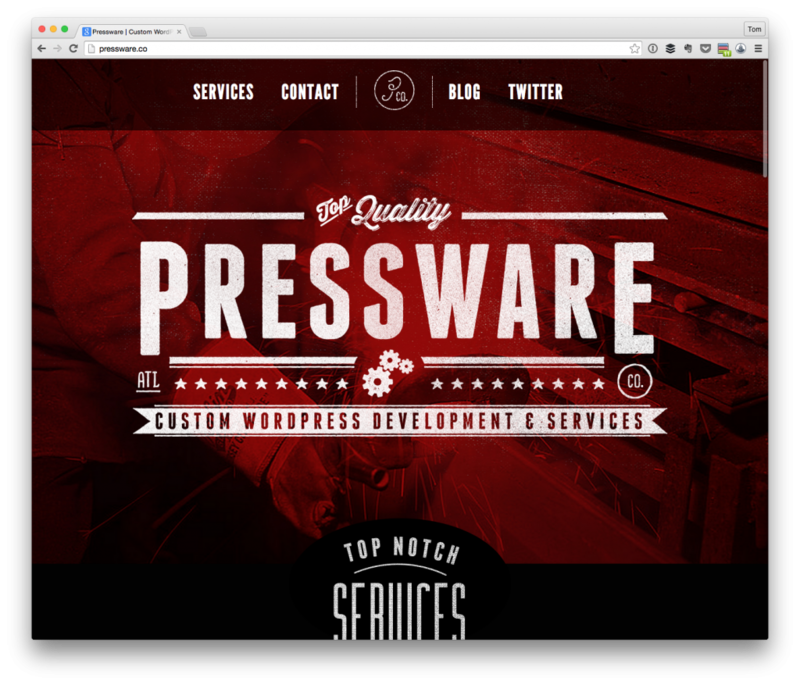 So as far as Pressware is concerned, it’s going to remain a contract-based, services-oriented business for now. Who knows what will happen over the next couple of years? This is where I’ve landed and it feels really good to have that clarity. Honestly, it’s kind of weird to talk about this blog as if it’s anything more than just a place where I share a few things that I’ve been working on, tips based on things that I’ve learned in my experience in building solutions with WordPress, and the random thought here and there on other topics. But I get email – almost daily – asking for my thoughts on certain things ranging from blogging and hosting to products and development. I really enjoy helping other people with this kind of stuff, but it’s really hard to spend time in my email doing this every day (especially since there are other responsibilities, too). Plus, I’m the last person to call myself an expert. I’m working through things just as much as the next person. I’m more than happy to share my opinion and the pros and cons of whatever it is you may ask, but I make no promises that I’m going to give the best solution. I can only give the best solution of which I am aware. Anyway, with that said, over the next few months, I want to begin introducing a few things into the site that will help make this a bit more of a resource that the typical, average daily post or something for the random drive-by visitor. Instead, I’d rather create a stronger resource for those who are involved in WordPress in any way and provide them with tools that help them get off the ground faster. No, I’ve no plans to write an eBook. 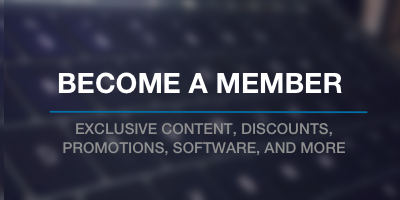 No, I’ve no plans to offer a membership site. No, I’ve no plans to create exclusive content that sits in a newsletter or a paywall. Other people do that and that’s their style (and more power to ’em!). Instead, I just want to begin sharing some of the things that I use and that I recommend in order to help other people decide what they need for their blog and/or their development efforts. That’s all. Nothing big, nothing major, just branching out a little bit more in hopes of helping other people a little bit more. I know – it seems weird to be building and maintaining a theme that I’m selling via one outlet but not using on my own site. And I do have my reasons for that. I also said that I’d be sharing my thoughts about this later. But as I continue to move things into place that will help me to make sure this site continues to be a larger resource beyond the daily blog post, there are other things I need to focus on accomplishing first. With that said, I’m open – as usual – to any all questions, comments, and critiques you may have as it relates to trying to helping mature this site a little bit more. I DO dig the new theme. I also dig the continuing direction of content you create, Tom. I really appreciate the insight into the goings on with Pressware and the continuing investment in the communities both WordPress and development. Thanks for the mention and can’t wait to see what comes next! Good for you, Tom. Mixing it up is always nice to do, especially for those of us that run our own businesses. Something I don’t see enough of are quality plugin reviews by trusted WP developers such as yourself. It seems like there are many review sites that focus more on hey, this came out and does this and less I recommend this because it is the best in its class, has solid and interested technical roots, and i’d use it myself. Just a thought. Enjoy the new direction. I look forward to where you are heading, as always. I’m looking forward to the new features. And regarding the theme, I am not suggesting that this is what you’re up to, but it would be wisely capitalistic to periodically feature a sponsored theme, and it would help the theme developers showcase their work. Wisely capitalistic. That cracks me up. That’s a pretty fantastic idea, Greg. Have you seen other bloggers do that? It seems so obvious…. I’m eager to begin putting newer recommendations and features in place, too, Greg so thanks for that :). I haven’t actually thought of highlighting a variety of themes per se, but that doesn’t mean I haven’t considered showcasing some recommendations periodically :). I hate to be “that guy” but I actually preferred the previous theme. But then again, maybe I just don’t like change :). Won’t stop me from showing up though. It’s okay to be “that guy.” I’m the same way with some things – we can’t please everyone :). I’m just glad that the look and feel isn’t enough to turn you off from actually wanting to read and comment ;P.
What are chances you will put your picture backup top? I miss the awesome hair! Seriously though, I do like the new look. I also completely understand what it means to use something you didn’t create for your own benefit. I mean isn’t that part of the point of the WordPress community? We wouldn’t feel weird by using a plugin someone else developed to enhance our site but we feel weird about using someone else’s theme. Personally I look at it like the maid that cleans houses all day but comes home to a messy house. To solve the problem she simply hires another maid. Why not? Once I get some time to continue customizing the child theme, it’ll be back :). We wouldn’t feel weird by using a plugin someone else developed to enhance our site but we feel weird about using someone else’s theme. The content on your site is invaluable, so it’s only natural that you’d want to use your own theme to manage it. I think we all suffer from this affliction once we start creating our own tools. But it’s also fun to use other tools and see how they interact with your content. I’m excited to see if this change in aesthetics has any quantifiable changes to the content, visitors, views, etc. Sounds like an interesting write up down the road! I also miss the avatar though! I’m eager to see how this changes the reception of the site as well – I’ve already stared tracking certain metrics to keep data on it :). As far as the avatar is concerned, it’s coming back once I have enough time to sit down and continue working on the child theme :). I thought you updated Mayer, then found out it is Author — by Array. I must say, it feels refreshing. That said, I look forward to the changes in content in upcoming months. Mayer is still available on WordPress.com and is available on GitHub, but I’ve other reasons for going with Author on this particular site. I’m still working through some of the finer details, but it’s a work in progress (as it seems things always are ;).